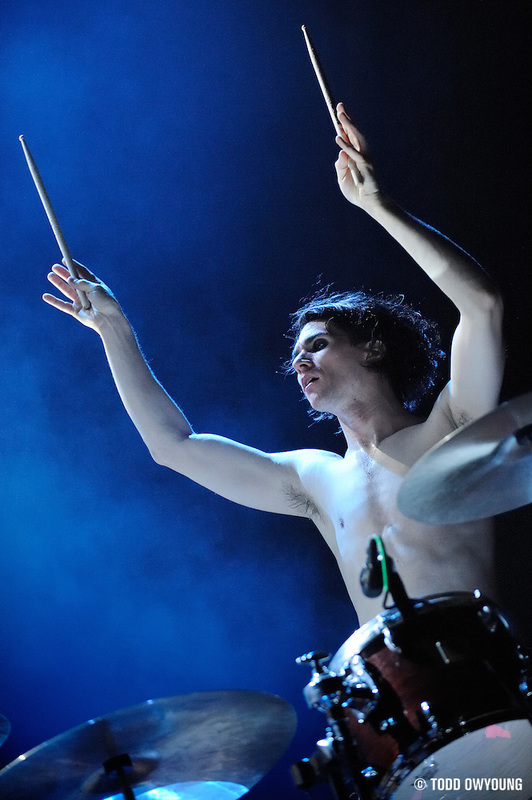 After a quick photo shoot with the Dresden Dolls prior to their show, it was time to come in for the real deal: the live performance. In their singular brand of “Brechtian punk cabaret,” the Dolls rocked the house in a raucous set that affirmed the duo's status as one of the best live shows around. Taking the stage in dramatic fashion wearing military-style cloaks and sequined masquerade masks, the two partners in crime assumed their stations and set into a furious energy that persisted throughout the entire performance. 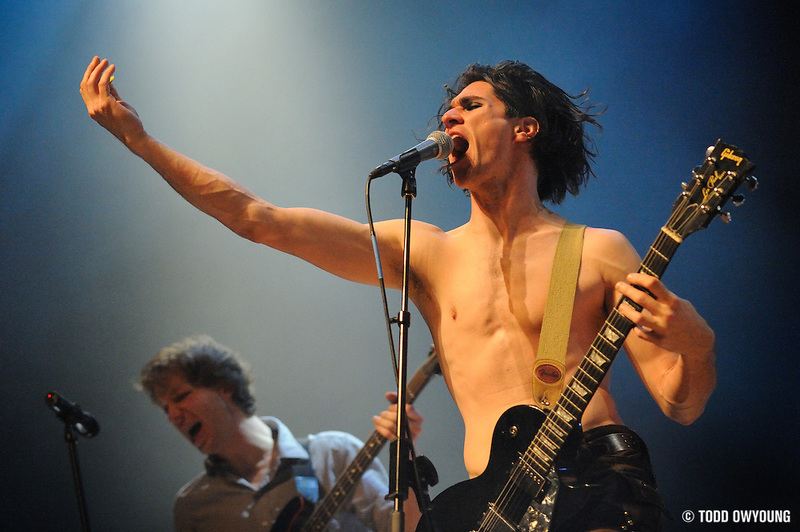 For those unfamiliar with what exactly constitutes “punk cabaret,” let alone that of the Brechtian variety, one need only be introduced to two musicians: Amanda Palmer and Brian Viglione. The group's dynamic sound is a product uniquely born from the collaboration that is at times incendiary, cathartic, and whimsical, often all at once. 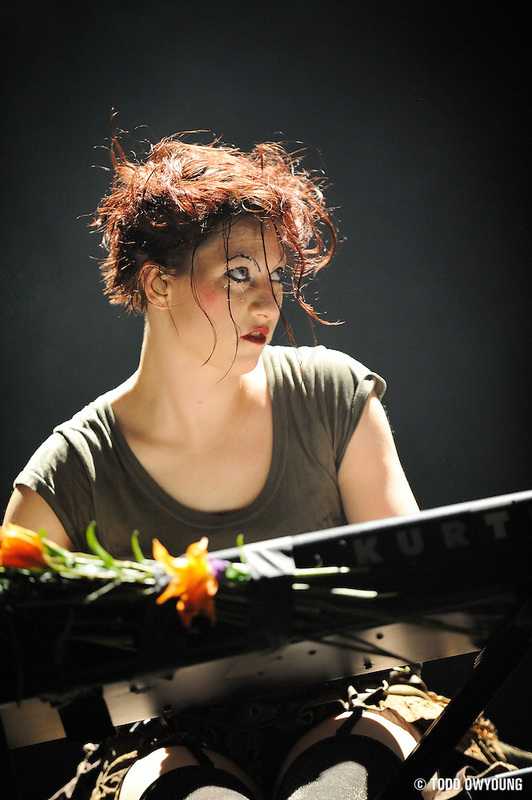 Seated at her Kurzweil keyboard, one half of the Dolls' sound is defined by Palmer's expressive vocals, which can rage from a whisper to a lion's roar all in the same bar, and reel from agony to ecstasy in as much space. 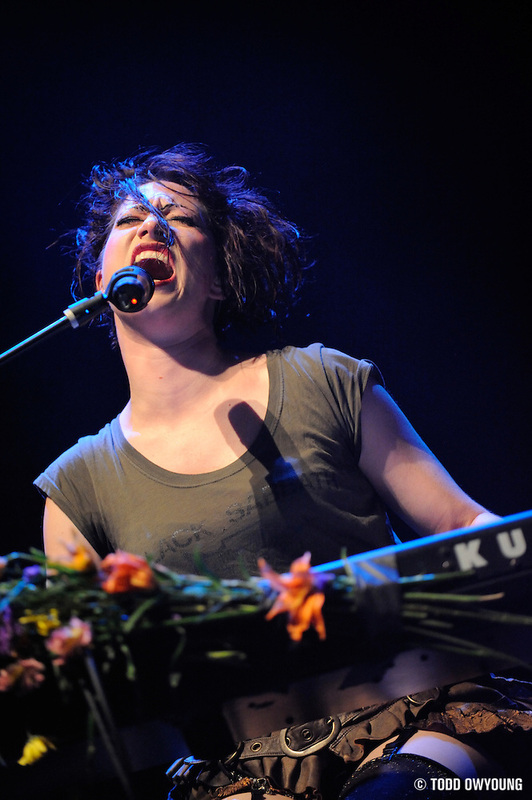 On the keyboard, Amanda Palmer delivers an animated performance that mirrors her vocal range, attacking the keys like she holds a grudge one moment and then gingerly extracting notes with a childlike fascination at another. 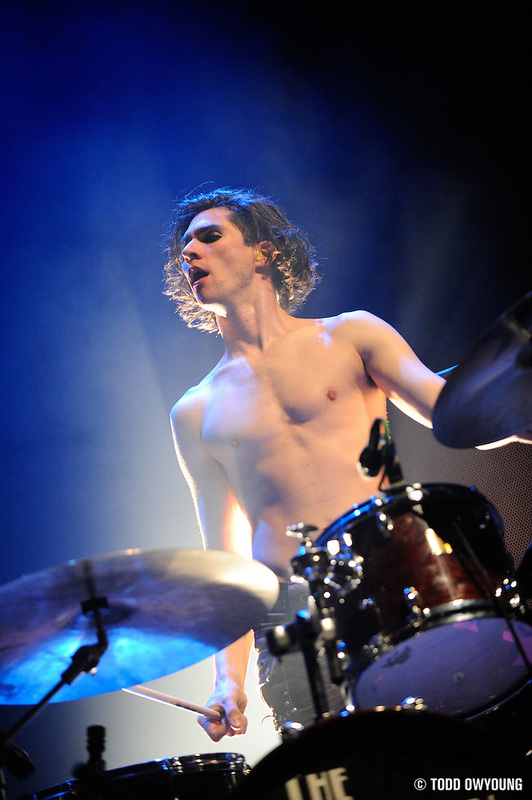 Complimenting her across the stage is Brian Vilgione, who adds a uniquely explosive sound to the group with his charged drum work and the sheer physicality of his playing style. 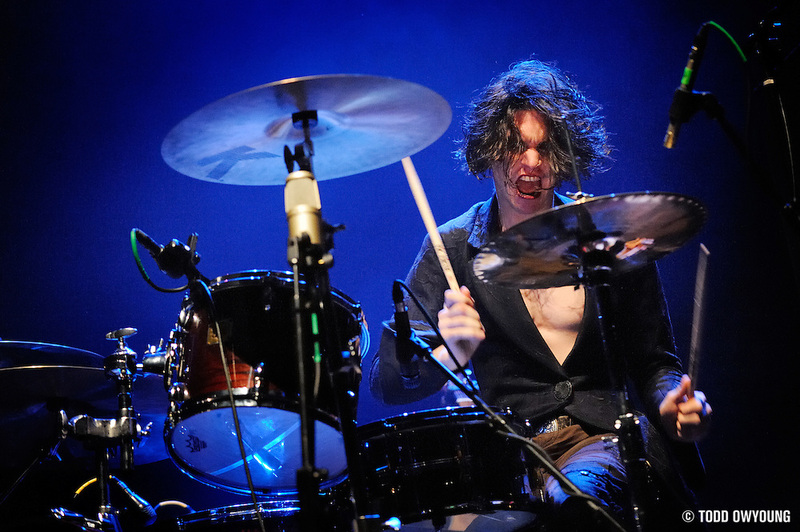 Like his counterpart, the drummer flies from a meticulously controlled pianissimo to a tempestuous assault of percussion, rolling between the two extremes with a deftness that should be both seen and heard. During the live performance, the Viglione is equally as likely to be seated or standing above his set, mugging all the while with a flare for theatrics fitting of any mime. On stage, the two performers are in constant conversation, both musically and through persistent eye contact as the songs progress, which adds a highly magnetic and organic appeal to the live shows. 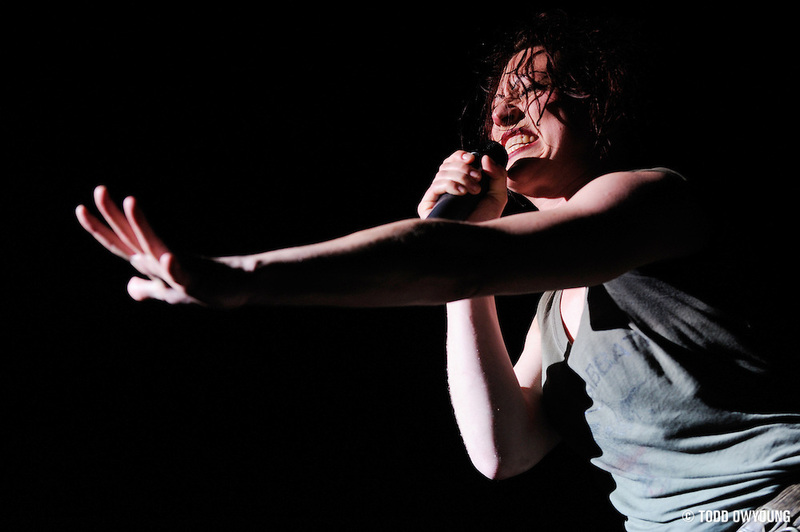 The “call and response” structure of many of the songs is one of the most engaging aspects of the live performances, not only for the musical dialogue but the gestural exchanges as well. 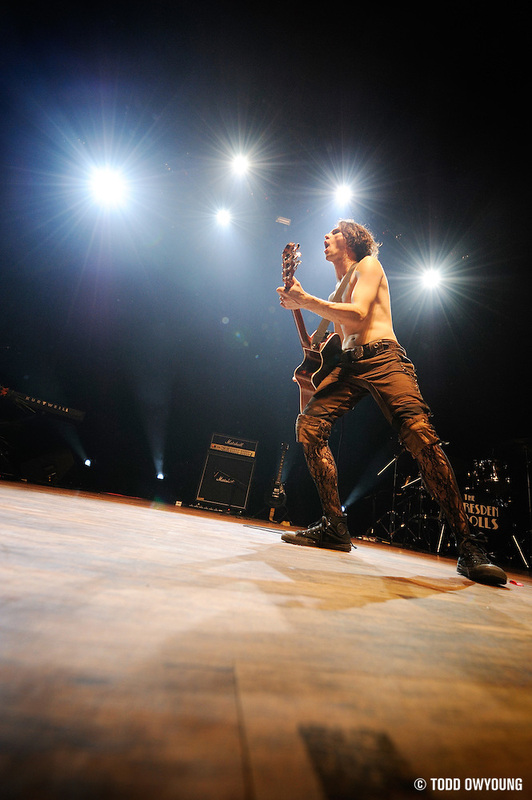 The setlist featured a relatively large selection from the Dolls' self-titled album, with almost an equal number of new songs. The 2006 release Yes, Virgina only saw very minor representation by comparison. Highlights from the performance included the ever-popular “Coin-Operated Boy,” “Missed Me,” “Girl Anachronism,” and a finale with the burlesque duo Gravity Plays Favorites and their namesake song. Viglione's drum solo during “Mandy Goes to Med School” drew a strong crowd reaction as well. And, like any proper Dresden Dolls show, the set featured a few choice covers: Pink Floyd's “In The Flesh,” Beck's “The Golden Age,” and an epic performance of the Beastie Boys' “Fight for Your Right,” which Amanda introduced as “a Yiddish protest song.” This last song, which drew the biggest crowd sing-along of the night, featured Brian taking over main vocal duties and playing the electric guitar, while Amanda helmed the drums with obvious relish. 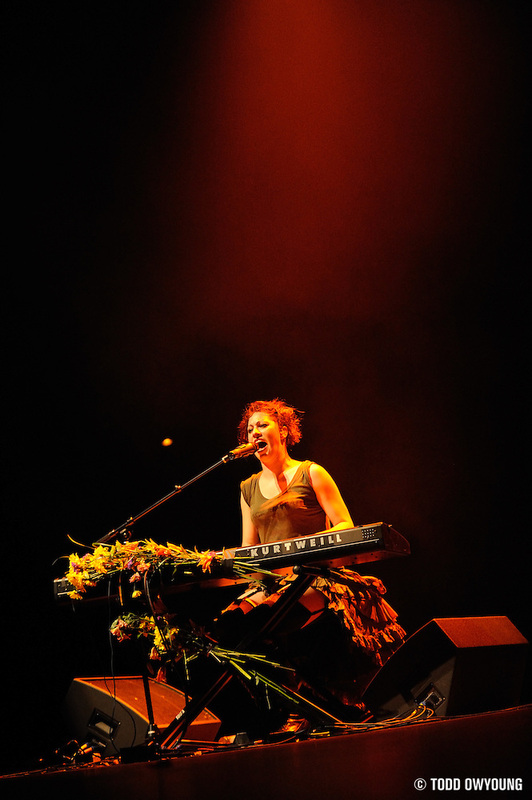 In addition, the duo performed one track, “Astronaut,” from Amanda's forthcoming solo album, which the band revealed is being produced by Ben Folds. From an outstanding tracklist that seamlessly wove in new material with the old, the two tracks I missed were the anthemic “Sing” and “Half Jack.” And for those songs, the Dresden Dolls will simply have to come back. Dividing by Zero has the bittorrent to the file linked up if you want to grab that, too. 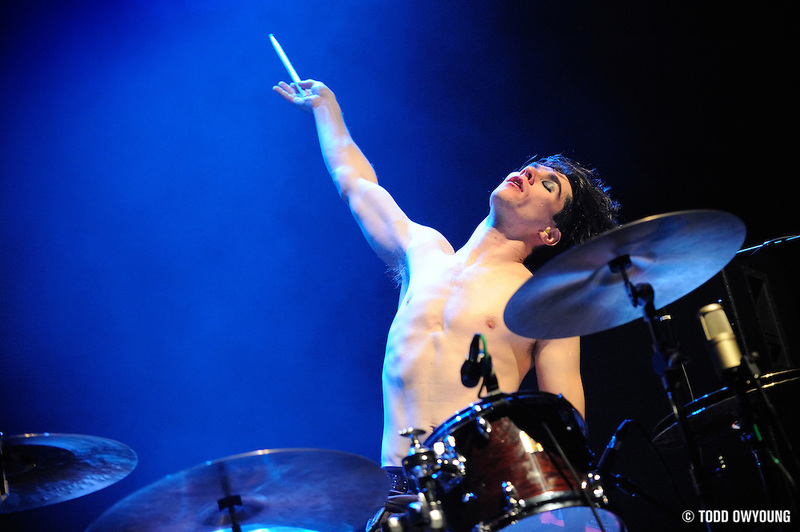 This performance marked the Dresden Dolls' return to to the Pageant after two performances at the venue in 2006, once opening for Panic! at the Disco during the Summer and again headlining their own Fall tour. Having covered both dates in 2006, I was excited to photograph the Dolls again with another year of experience, not to mention the Nikon D3. One thing I love about the Dolls is that they're consistently open and welcoming to photographers. Setting up credentials for this show was an easy task, facilitated by the Dolls' wonderful publicist, Anabel. 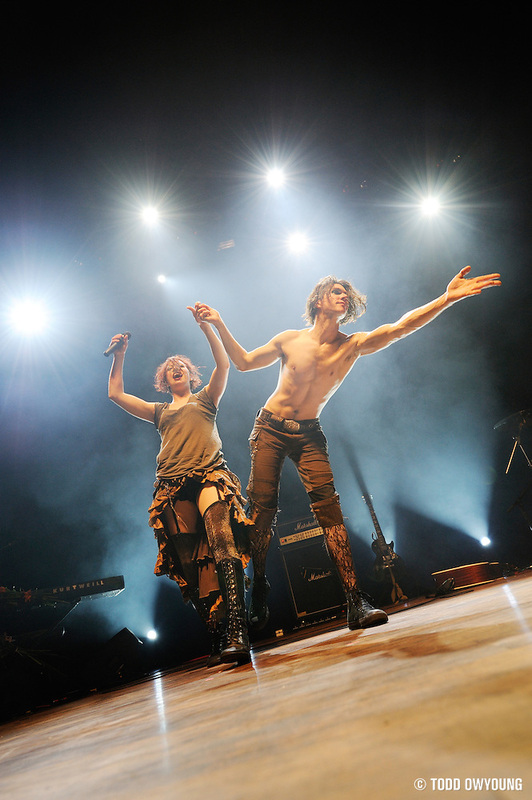 For anyone shooting the Dresden Dolls now or in the future, one important fact to note is that because of the band's very open camera policy, they don't always issue photo passes. I know some other photographers who had set up credentials ran into trouble due to the lack of photo passes, since security was only allowing photogs with all access passes into the photo pit. While their cameras were OK in the venue, the floor was absolutely packed and without the proper passes, the shooting options were very limited, especially without a long lens. In addition, Anabel had mentioned that for some dates on the tour, there had been no photo pit made available, but that it would likely depend on the venue. 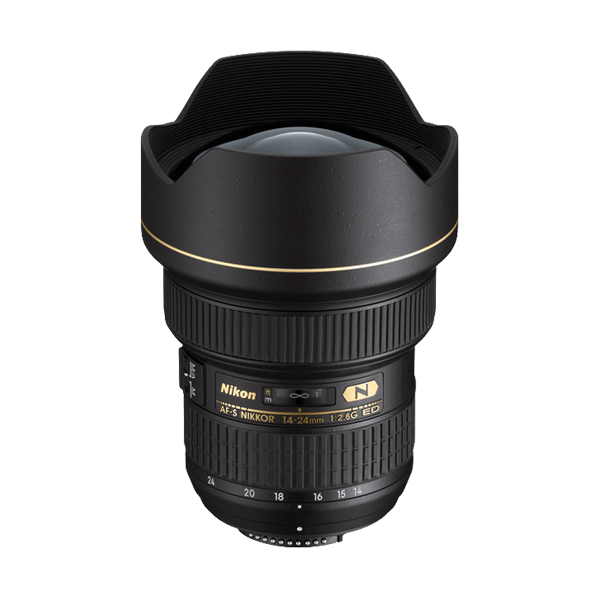 Since their previous headlining performance at the Pageant had included a pit for photographers, I wasn't too worried, but kept this consideration in mind and packed the Nikon 70-200mm f/2.8 just in case I had to shoot from the balcony. 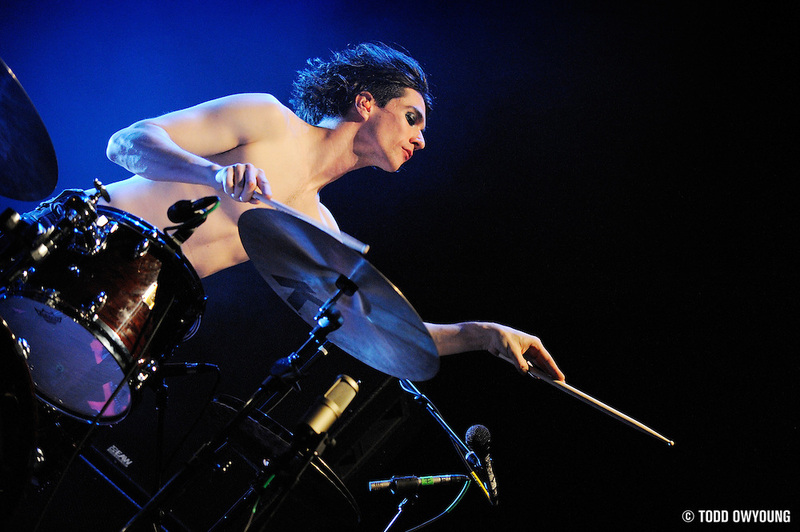 Just before checking in with the Dresden Dolls' manager, I overheard her talking with the staff about the pit barricade; the staff assured her that there would be still plenty of interaction between the fans and the band despite the small gap. 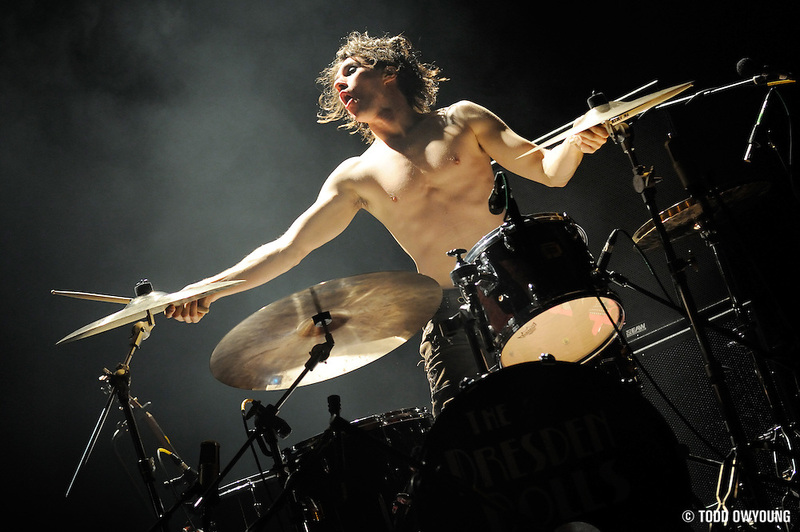 For anyone shooting this tour or other performances by the Dresden Dolls, you might be out of luck for a pit unless it's the venue's policy to have one, which seems to have been the case with the Pageant. As a very photo-friendly band, the Dolls granted me an all-access pass for the show and I was able to shoot for the entirety of the performance from anywhere in the house. Still, despite stage access, I found that the pit provided some of the best vantage points for the group. With Brian and Amanda positioned on opposite sides of the stage, I found that center stage provided a great spot for shooting both performers.This was especially true for shooting Brian stage left, given the setup of his kit, which is relatively open from the front. Shooting from the side provided less clean shots, due to a high cymbal and the position of his mic stand. Amanda, positioned in her traditional stage right spot, was a little more difficult to photograph due to the position of her mic stand, the arm of which cut across parallel to her keyboard. I found the best shots of Amanda when she was seated came when the singer reeled back slightly from the mic, which incidentally coincided with some of her best facial expressions. By contrast, photographing Brian was a decidedly different experience, given his relatively open drum kit and flare for the dramatic, both of which made photographing the drummer a blast. In talking to my brother, who also photographed the Dolls recently, we agreed that editing through shots of Brian was much harder. I know, it's a tough position to be in. 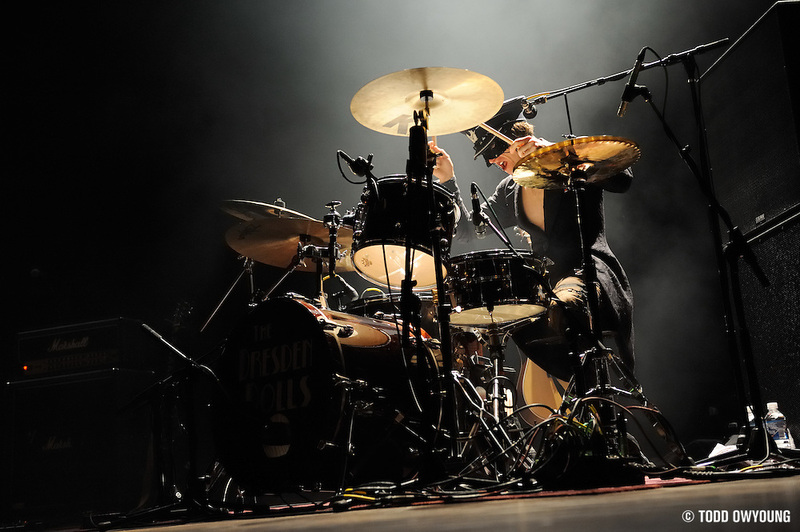 Credentials to photograph the Dresden Dolls is pretty much like a license to fish with dynamite. It's deciding what to do with the catch afterwards that's the problem. Lighting for this set was fairly straight forward, with three main lighting schemes: red, blue, and white, with an emphasis on the latter. During much of the set, deep blue backlighting and dim, white front lighting would dominate many of the songs. This scheme was often punctuated by a slightly cool white light during the most fierce parts of the songs, giving especially dramatic effect to Brian on the drums. In addition to the standard front and backlighting, two lights positioned behind the two players provided additional accents that combined with water hazers to cast some nice shadows at times. While the band was seated, I utilized the Nikon 70-200mm f/2.8 almost exclusively. The range of the lens was nearly ideal for shooting from the pit and gave plenty of framing options for the two players. When Amanda and Brian were more mobile during the second half of the performance, the Nikon 24-70mm f/2.8 and Nikon 14-24mm f/2.8 came into play. The extreme wide angle of the latter was especially useful as the pair came to the front of the stage. There was generally plenty of light, but I shot primarily between ISO 3200 and ISO 6400 for this set, opting to stop down and increase shutter speeds rather than lower the sensitivity. Had I shot this gig with the Nikon D2x instead, I'm sure I would have shot at ISO with more marginal shutter speeds. Needless to say, the freedom of the clean high ISO performance afforded by the Nikon D3 was very welcome for this show. In what would have been a luxury with the old camera, I stopped down to between f/3.2 to and f/3.5, and kept shutter speeds at 1/200 and faster. Again, a big thanks to Amanda and Brian for being such engaging subjects in the promo shoot before the performance, and of course for the fantastic performance itself. Also, as always, thanks to Anabel for setting for setting everything up. Last but not least, thanks again to Katie Kay for handling the moving target of the shoot and all the stress of the tour with such grace. Katie was instrumental in making everything run smoothly. It's a pleasure to have such an accessible group and to deal with genuinely great people who treat business more like a conversation with a friend. 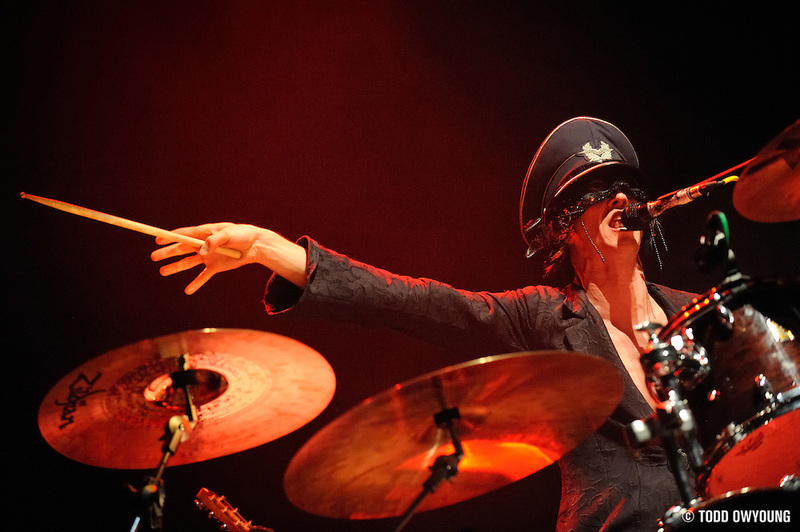 To all the photographers out there, you owe it to yourself to catch the Dresden Dolls live, because you'll be hard pressed to find a better pair to photograph. If they're coming to a city near you, do not miss them! Love the one of Brian on right with acoustic and Amanda on left with arm raised. 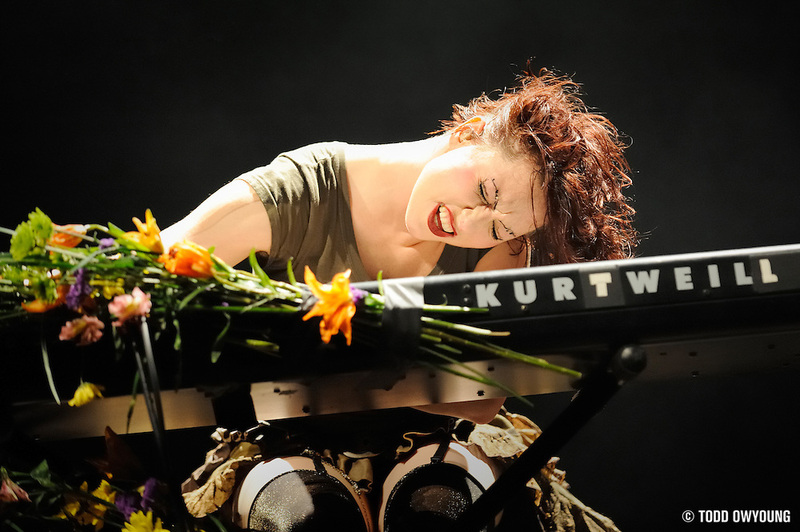 Also love the one of Amanda crushing it with her head across the KURTWEILL on the keys. Thanks for the picks, Chris. For some reason, I almost didn’t include the solo shot of Amanda you mention — I just converted/processed it last night. This show was just too good, and generated a huge amount of solid shots, so it was tough to decide what to put in. My reasons for liking that shot are very photo editor. 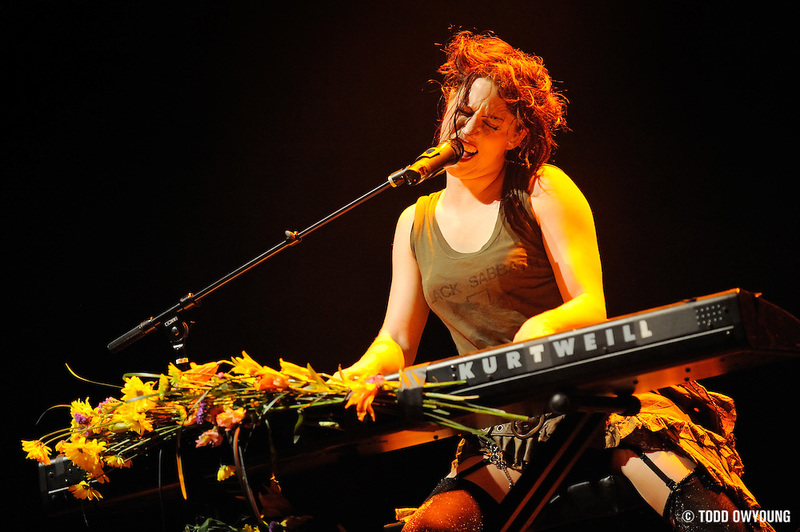 I think I like that one because it shows raw emotion, the lighting is clean, and she’s totally clear of the mic. Also, one of the photos is missing on flickr. Fix the permissions. Yeah, that shot of Amanda killing it made it to the second to last cutoff — just didn’t get processed the first time around. The set easily produced 100 totally solid shots, but they don’t necessary show different things. Just slightly different flavors of awesome from slightly different angles. These two are just too much fun to photograph. Image fixed, thanks for the heads up. Yeah, my set generated a lot of rock solid images that were, as we discussed, very hard to edit. It’s going to take me a long time to whittle down. Awesome and More Awesome. They go to Eleven. Chris – they did do Sing, that was the last song! Did you split before the final encore? Man, I hope I didn’t dream that. Set list is a bit out of order too, Gardener came after NYE, when Amanda walked through the audience with the flower, it was spine chilling moment. Also Brian did a little 30 second snippet of Run to the Hills. Anyway thanks for the great photos from both of you, amazing shots. Thanks for checking out the images. Amanda came out into the audience for the St. Louis show at the Pageant as well, though no crowd surfing like the NYC gig. 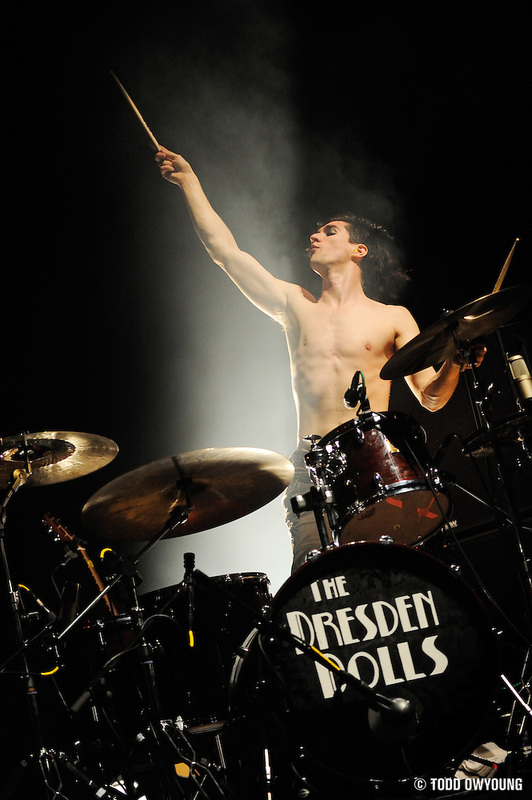 Great show, the Dresden Dolls are an amazing group to photograph and see live. Thanks, I appreciate it. 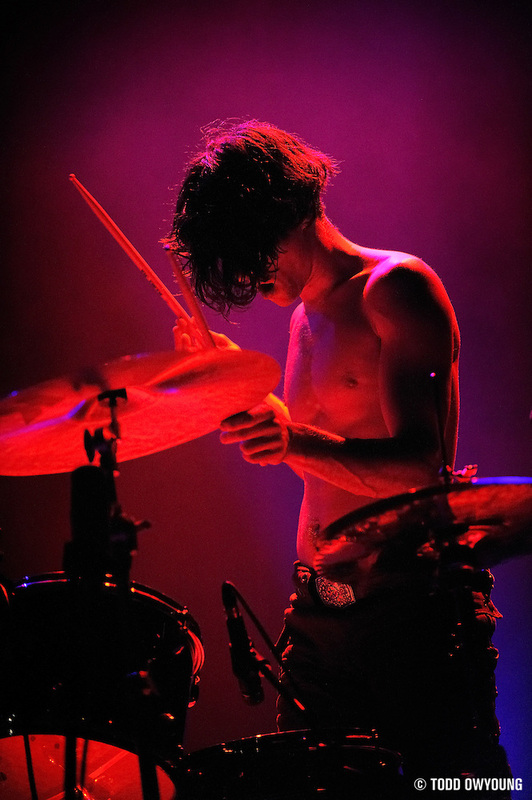 This was the third time I’d photographed the band and it was a great experience shooting. Thanks for the support! That concert was pretty sweet and love the photos. Weird thing is that one of my friends that I came with knew one of the girls that did the pole dancing at the beginning of the show and she came over and talked to us for about five minutes before the show and we had no idea she was part of the act that night. But the concert was a ton of fun and the Dolls put on a hell of a show. 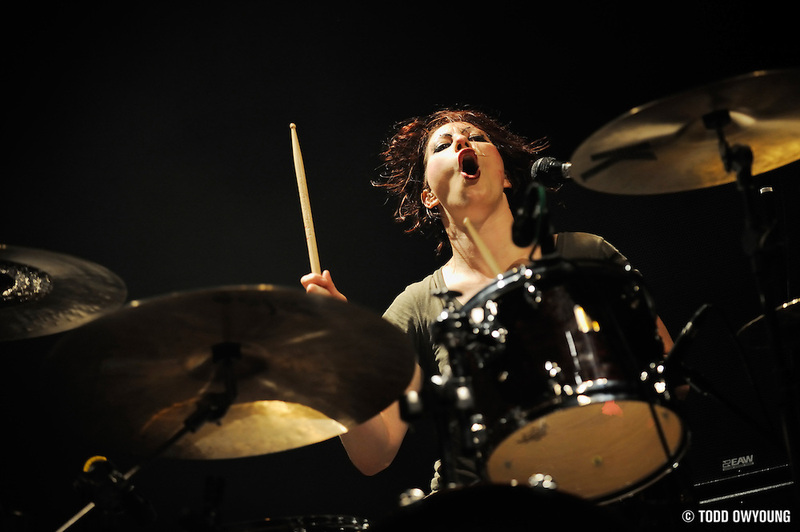 Yeah, the Dresden Dolls always bring it. This was a fantastic show — it’s really hard to argue with a Beastie Boys cover, especially from the Dolls. I’d seen Gravity Plays Favorites the last time the Dresden Dolls came, so I knew what to expect this show. The only downside to photographing them this time around was that their setup was really close to the front of the stage and so the front lights were casting very deep shadows, given the angle. Thanks for the feedback, glad you dig this set. Todd , I’m simply blown away by this set…superb work! Thanks very much for the feedback, the Dreden Dolls are a fantastic duo to photograph. I know they just performed in in NYC on NYE, but I hope they come back and you get a chance to photograph them. One great thing about the Dolls, other than being one of the most theatrical and engaging live acts around, is that I was able to shoot through the whole show, which certainly benefits the images. I can almost feel the sweat drip off her in the 2nd photo after the jump. This is a fantastic set. As always, I learn so much reading your extremely thorough and informative reviews! Hey Diana, thanks for the feedback on this set — the shot you picked out is one of my favorites of Amanda. As I have said, the Dolls were absolutely wonderful to photograph, as always. Thanks for the support, glad to hear that the write-ups are useful to you. Todd, these photos are out of this world. You used your gear to perfection on this one. Sweet job! Hey Keith, thanks. I viewed this shoot as one of the major tests of the D3, and it performed very, very well. Thanks for the feedback. Not use to getting Concert Reviews from you Todd, but very well done. Amazing shots in this set.